Applesauce is a great thing. It's healthy, it's handy for baking, and kids dig it. Okay, so do I. I've been feeding a lot of it to the baby since our apples started coming ripe earlier this month on our old apple tree. But even a baby likes a little variety, right? So I've started making applesauce fruit blends - combining our sweet apples with strawberries, blueberries, and peaches - and canning them in jars so the whole family can enjoy them in the autumn and winter months to come. There's no added sugar and these sauces can be frozen in freezer containers if you don't want to can them. The water amounts in these recipes range so the sauce can be made thicker or thinner. Generally, you want the water to come about half way up your fruit in the stock pot. For each recipe, I combined the fruit and water in a large stock pot and brought it to a boil over high heat. I reduced the heat to medium and stirred occasionally while the sauce simmered, uncovered, for 25 minutes. This is where the kitchen starts to smell dreamy and delicious. Each sauce was then ladled into my chinois and pressed using the wooden dowel (the sauce could also be run through a food mill, food processor, or blender, skins and all). The sauce was then ladled into the jars, leaving a half inch of head space. Each jar rim was wiped with a clean cloth, and the sealing discs were secured in place with the bands. The jars were processed in the water bath canner, with the tops resting one to two inches inches below the water surface, for 15 minutes. They were removed to cool on the counter and reward me with their POP! I've come to love the sound of a perfect seal. Generally, I leave my jars on the counter for about 12 hours to make sure they seal. Lately we've been going through a couple jars of applesauce a week, so the couple dozen jars made so far won't last as long as I'd like. S'okay though! There are a lot more apples to come off the tree. I've been really busy in the kitchen lately. Between the apple tree and the giant zucchinis I'm still trying to use up, I've been at the stove several times each day. I could complain, I suppose, and I do sometimes. It's hard devoting a big chunk of time to canning while taking care of two small kiddies! But I love it. And I love them. Mr. Feedbag gently reminded me this week that they're just apples, and if a few get wasted (or dropped down the side stairs or used as a hockey puck) that's okay. If the baby is crying he needs me in that moment more than he needs homemade applesauce. Do you find it nearly impossible to commit a chunk of time to a big kitchen project while caring for your kids? What do you do with the kids to get your projects done? What big kitchen projects do you love to take on when you get the chance? We didn't either, but we made the decision to just do it. We canned salsa and it was not hard at all. We did the water bath method to start, next is pressure canning. The most difficult part was literally peeling and seeding that many tomatoes. Loved it though. We have the bug. I have been daydreaming of all the deliciousness that can go in a jar....ah, the possibilities! Yup, you've got the canning bug for sure! This is fantastic, I will be making applesauce later as we used our last one from last year, and I will have to try this. Anon - You could keep it in the fridge safely for at least 8 weeks. Alicia - Sounds like a great way to spend some mom time! Ali - Thanks for passing my recipe on. Shauna - 600 trees?!?! OMG I can barely keep up with one. You are one lucky daughter! They're "dwarf" trees, so you need a footstool for some of them, and others I can even pick, and I'm not gifted in height! Still, it's fabulous having a seemingly never-ending apple supply. They sell at at the Duncan farmer's market, and have sold in some stores in the past. A lot of work for a little on the side hobby, though! I can not WAIT to try all of these. I'm like a kid and LOVE applesauce, especially all the fun flavors! making mine today! Thank you for sharing! Thank you! I make apple sauce for freezing, but have never thought to can it. Here in England we don't have a strong canning tradition, sweet jam merely needs a hot jar to keep well. I feel I've a lot to learn! Wendy - I haven't baked with the fruit blends yet, but I have baked with my homemade applesauce. I suspect you could interchange them no problem because it's still mostly apples. I bet the fruit blends would be great in applesauce muffins! This look absolutely wonderful! I think you've convinced me to can some applesauce this year! This is a fabulous recipe! Thank you for sharing. Have many pints does 1 of your recipes make?? Anonymous - The volume of sauce depends on how much water you add to your pot (the recipe calls for anywhere from 2 to 4 cups of water). A thinner sauce will produce as much as 5 pints, while a thicker sauce may only produce 3 or 4. Thanks for reading! I don't have a chinois. Could I put apples through a food processor with skins on after boiling? I'd love to keep that pink color. Yes, you could run it through a food processor or a blender with the skins on. It would be totally edible as long as the skins are cooked soft, just not as smooth. An inexpensive food mill is a great option too. I have a food mill that has differant sized holes on the bottom plates. They range from small enough to pass as a juicer, medium which produces pure pulp with no skins etc (this gets annoying when you have a lot to pass through with skins on though) and large that lets some bits of skin pass though but also lets the pulp have a small bit of chunk to it as well. It isn't ideal for large amounts because it is hand turn but it does its job well when we need it. We used it before for a lot of pear butter and pear sauce, I had to take something for my shoulders the next day... they really hurt! Thanks for posting this, I made 40 quarts of applesauce yesterday and thanks to reading this I put blackberries in about 20 of the jars, it is SO yummy and my kids LOVE it!! Mommy of 4 - You are my hero for making 40 quarts in one day! Go mama go! Hello. Im interested in trying this, but I dont know what a water bath canner is. Thanks. This looks so yummy! And I've found the only way to tackle big kitchen projects with my two little ones (27 months and 5 months) is with a fort, lego duplos, Cars the movie or Shaun the Sheep episodes (as a last resort), and lots of snacks. The 5 month old hangs out in the baby sling. You have done something amazing with all those apples! I'm from Wisconsin and we get alot of cranberries.. and apples. So I've made cranberry applesauce and all of Grandkids love it. I put it on my pancakes, Sweet and Tart !! Well, today we made the peach applesauce. Tomorrow we are going to try the strawberry and apple. We really liked the peach applesauce, but I did start with the 4C of water, and its a bit thin for me. I was hoping our big ole Ga Peaches would help with that, but they didn't, so next time I will cut back on the fluid. Thanks so much for such a great idea for me and my family. can't wait to check out your other ideas! Hi hi! This looks amazing! I just started canning about a month ago and have done a variety of pickled veggies but nothing like this! I cant wait to try it :) I have had a problem with a few of my jars not sealing? I was putting the seal and ring on when I boil my jars but my grandfather says not to put the ring on? Which is right lol he says if the ring is on and screwed down the air cant get out? Thanks for any help! Hi! You need the ring on during processing to keep the seal in place. However, if your ring is too tight the air inside the jar can't escape to create a seal. So, when screwing on your ring, screw it until just past the point of no screwing resistance and leave it there, don't make it any tighter. Once your processed jars have cooled and sealed you can remove the rings during storage if you wish. Delicious! I just made strawberry apple sauce. Now I want to try pear applesauce. How many pears do you think I would need to make a batch? It's really up to you. I made some pear applesauce about a month ago and I think I used about 2 lbs pears to 5 lbs apples. So... about 5 large ripe pears. And Amy, can you can the pear sauce the same as the applesauce? love this recipe! any suggestions on what to do with the left over juice from the stock pot? If you don't have fresh fruit to add to your applesauce,I have used dehydrated or dryed fruit . Hi, thanks for this awesome post! A friend and I tried out the peach sauce today with a few changes. Since we were canning peaches, we put our apples and peaches (via your recipe minus the water) in the crock pot and let it cook while we did the rest of our canning. As soon as the peach canning was done, we transferred the applesauce to the jars and canned them too! Quick work and so yummy!!! Thanks for the feedback! 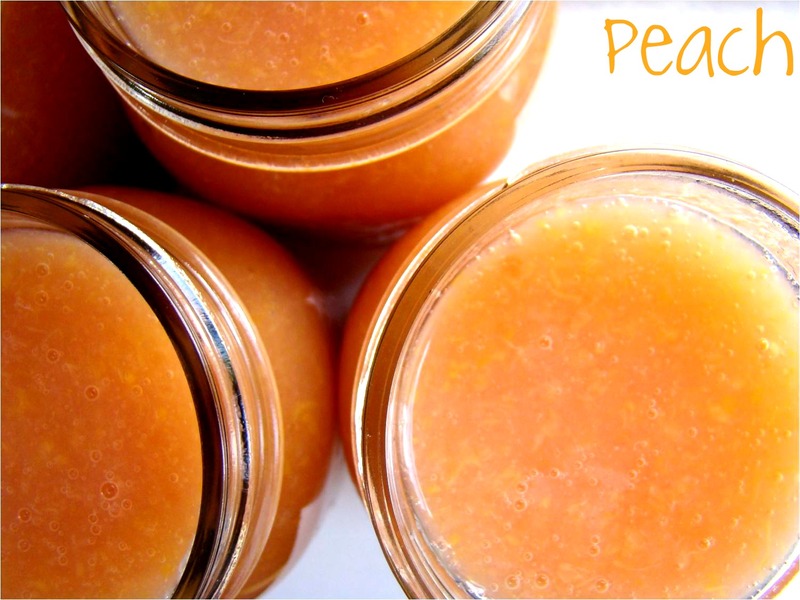 Crockpot peach applesauce - great idea. Applesauce, peach butter, tomato jam, ketchup, etc., I make them all in one of two old crockpots I've inherited. It takes a lot longer for things to cook down of course, but it is so much more forgiving. If I need to step away to get someone a snack or naptime hits, I can just turn it off and come back later. As for recipes that are time critical, like jams and jellies, I prep all my ingredients during the day and can like mad after bedtime! Makes for a tired Mama, but a full pantry. Do you have a post about your chinois? I tried to google to figure out what it was, but can't seem to find one. I've always peeled my apples when making applesauce, but love the idea of skipping that step! As an alternative, you could use a collander, sieve, manual food mill, or you can simply puree it (skins and all) with a stand or immersion blender. Thanks so much for this! I might just use the collander we have, but I am very intrigued. I just moved to Victoria and don't know the city very well yet--do you mind telling me which store you ordered it from? It'll give me an excuse to look at pretty cooking gadgets! I ordered it through Muffet and Louisa, which used to be located in Market Square at the corner of Pandora and Wharf. However, it's no longer there (the super awesome home store Paboom is there now!). Muffet and Louisa is still in their Sidney location though. Thanks for this! And thank you for answering comments on a post that's a year old. Im so impressed with your beautiful applesauce and Im experiemnting with a tropical medley today- any advice? Im using an assortment of strawberries, mangoes and pineapple (2 lbs total) along with the 5 pounds of apples your recipe calls for. Is there no need for lemon juice when canning this? Sounds like a delicious combination! The only advice I could offer is to chop the mango and pineapple into smallish pieces to help them cook because, depending on their ripeness, they may not cook into a mush as easily as the apple. And, no, no lemon juice is required in canning applesauce (unless you just like the flavour) because apples are low PH (AKA high acid) and can be canned safely in a water bath canner without added acid. Have fun saucing! Thank you!It turned out fabulous- I used my vitamix to chop the fruit up after cooking and the consistency and color are perfect... planning to make more today :0) I have had way too much fun doing this!! Glad to hear it, Kati! For saucing, it's all good! But some favourites in general are spartan, gala and cortland. I've been doing tons of (first-time) canning this summer, and undertook applesauce for the first time yesterday - so easy! I think I'll try fruit blends next. My strawberries and blueberries are frozen from earlier in the summer - that should work OK, yes? Absolutely! I love hearing about the adventures of new canners. That was me not too long ago :) Have fun saucing! You say, "These jars are processed in water bath canner a couple of inches below the water surface". I'm not sure exactly what that means. You do not submerge the jars in water to cover over an inch. Or the jars are processed in water below the seals? There should be at least one inch of water above the top of the filled jars while they are boiling in the canner. I hope I understood your question correctly. Does that help? Do you have a recipe for just plain applesauce? Sure! 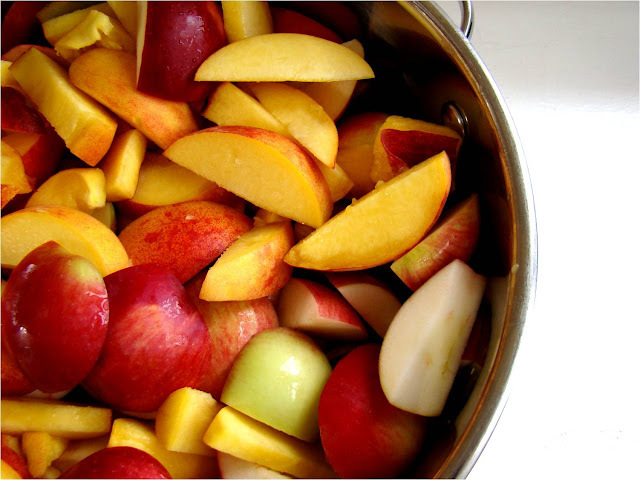 Peel, core and chop 4-5 lbs of apples and place in your largest pot. Add water to as much as half way up your apples (use less for thicker applesauce). Bring to a boil over high heat, then reduce heat to medium and simmer, uncovered and stirring often, for about 30 minutes until the apples are mushy. Puree with a blender or mash right in the pot with a potato masher. Add sugar and/or cinnamon to taste if desired. Thanks! I'll use the canning recipe! I used to go gather the apples, this year there were none on it, mix with cranberries, cook, with skins to get all nutrition and red colour. Sieve through old antique sieve with hand crank. From there, I would drip for wild apple cranberry jelly half. The other half, I would use for jam version with certo. And finally, some jars of the sauce itself which was superb paired with turkey! Yummmm! I still have some of the jam left, I hope this coming year that tree has apples! I'm sure that lonely tree loved having you make the most of every one of those apples! What types of apples make the bet sauce? So many varieties to choose from! The answer to that question is: whichever apples you like! I have always wanted to find a recipe for strawberry,banana applesauce but have had no luck. Do you know of one and if so is it ok to can bananas? Great question! Bananas on their own should not be water bath canned as they are a low acid food. Adding acid, such as lemon juice, could MAYBE bring a strawberry/apple/banana mixture to a safe PH, but without actually testing the mixture you can't be sure. So I can't recommend canning strawberry banana applesauce in a water bath canner. You could, however, simply stir some mashed banana into your strawberry applesauce when you serve it! I hope that helps. I am hoping you can come up with APRICOT applesauce !!!!! One of the babyfood makers used to make this (and may still ) and I ate more than my child did !!!!! I will be waiting, and watching !!!!! I dearly loved the apple/banana sauce I used to find in the grocery store a few years ago but now don't. I wonder... how that could be replicated? I wonder how the bananas would fair in this sauce for home canning purposes? You could try adding some nanners and freezing your applesauce. I wouldn't can applesauce with added bananas though because you can't be sure of the PH once the bananas are added. I tried the strawberry applesauce with some freshly picked berries and OH MY GOD it was the BEST applesauce I have ever had. I am down to 1/2 a jar and will def be making 4 batches this week with my CSA share. I am going to try cherry applesauce as well as apricot applesauce. So glad you liked it, Lexi! Can you do it with peeling the apples? Yes, you can. Get it? You CAN? Har har. Would your recipes work using crab apples? My grandson loves peach applesauce and the crab apples from my tree are less tart than a granny smith. Go for it! You may need to add some sugar, but just taste as you go. Hi Deb. Yes, you can peel the apples and skip the chinois step, although you still may have chunks of fruit in your sauce, depending on which fruit your using. If you're fond of small chunks, great! If not, you can run it through your blender or food processor. Thanks for your question! I have extra plums that need used, could I used them? and should they be peeled first? Plum applesauce would be lovely. I wouldn't bother peeling first if you're going to process the applesauce through a chinois, food mill or blender after cooking it. When I can applesauce instead of using water I use organic apple cider. It intensifies the apple flavor. Hello Amy! I was wondering -- do you think your recipes would work with pears instead of apples? I have come into a.. plethora of pears.. and was hoping to make a few different varieties of pear sauce. Thanks! Hi Ashleigh. Sure, you can make pear sauce. It's a little more grainy than applesauce, but still delicious and can be prepared the same way. You'll want to start with ripe pears so that they'll cook down nicely and, because pears don't ripen on the tree, they should be left at room temperature for 3-5 days to soften around the neck. Have fun saucing! How do you just make a regular batch of applesauce. I have to start with the basics, before adding things! If you don't want it pink, or you just want to skip skimming off the skins, you can peel the apples first and mash it up with a potato masher when it's done cooking. Just fyi for those of you that pick apples from the ground... if deer are prevalent in your area and stand at the apple trees to eat, you have the possibility of introducing E. Colin into you batch. I haven't researched if the canning process kills that bacteria but it would be worth perusing if you gather your apples that way. Can you slice and core the apples and freeze when you have enough to make a big enough batch? Yes, applesauce is a nice use for frozen apples. I like to freeze pieces of fruit on a cookie sheet first before putting into freezer bags or containers. That way they don't stick together in one big frozen block. I just found your site and it helped me make quick work of saving a bowlful of apples that might otherwise have gone to waste. In less than an hour I was able to turn the neglected bowl of apples into 9 jars of appetizing blackberry applesauce. I added some frozen blackberries that I picked earlier this summer and the colour turned out great. The aroma had everyone in the house coming to check out what smelled so good! I love that this recipe is just made of REAL FOOD and no sugar, nor preservatives. I am glad I found this site. I am older, and looking for a recipe where I can combine applesauce (because of its high pectin and soluble fiber content) with wild picked Autumn Olives (which are very high in Lycopene). I have high cholesterol, and the combination of the high pectin and soluble fiber can help reduce cholesterol levels. The Lycopene in the Autumn Olives is 10-14 times higher than tomatoes, and lycopene is good in fighting heart disease and other things. 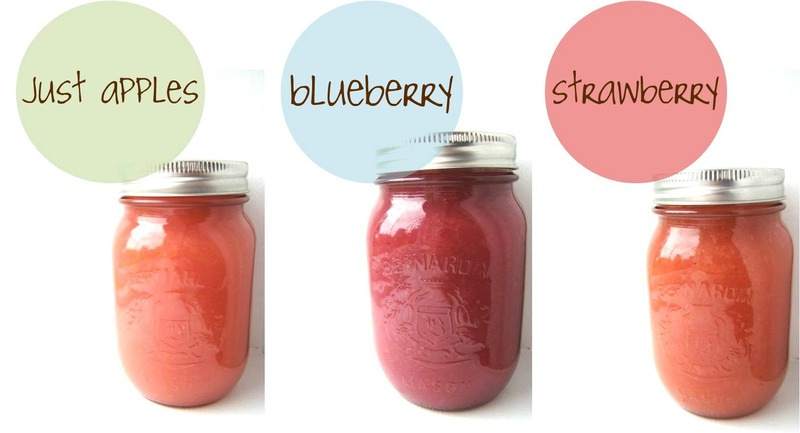 Your applesauce with other fruits is a great idea to get ALL of the benefits of apples and wild Autumn Olives. Autumn Olive jam is yummy! Its wild, and FREE, and you are helping keep this invasive bush in check also. I do suggest you keep the cores in the apples (seeds and all) when you cook the fruit, because the cores along with the skins have the most pectin content in them. The cooking process neutalizes any harmful chemicals in the apple seeds. I have done a LOT of reading up on this and know this is true, not just an urban legend. (smile). When you strain the fruit, you will get rid of the apple and Autumn Olive seeds - but keep the pulp, cooked skin and pectin. It is important to make sure that you get the red SKINS of the Autumn Olives in the sauce because this is where the lycopene is. 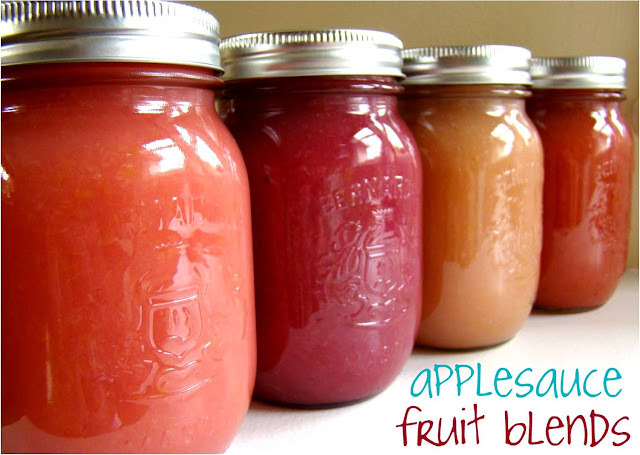 Do you have any recommendations on how to make a strawberry banana applesauce? Hi Jessica. I don't can bananas. They are a low acid food and the texture is better suited to freezing. So, if you were to mash a banana to add to your strawberry applesauce, you can always just put the finished sauce in the freezer. I'm looking to can apples and strawberries together without the sugar and pectin. Because I'm not worried about the consistency, could you can the mixture before you strain it? I'm going to be adding the mixture to a smoothie mix so it will all be blended in the end. Thoughts? Thanks! Hi. Apples and strawberries are both in the safe pH zone for water bath canning. So, yes, canning them on their own or together is perfectly safe. However, you should cook the apples first by boiling them in a little water (in chunks or slices) for 5 minutes before putting them in jars for better quality preserves. Be sure to top up with a little of the cooking liquid to avoid air pockets in your jars. But, if you are just adding your apples and strawberries to smoothies, you might want to consider just chopping your fruit and storing it in the freezer. Particularly the strawberries, as they tend to maintain their bright colour better in the freezer. I'm sure this is a stupid question, and I apologize ahead of time (I'm new to canning). Is it possible to simply can the strawberries mashed up? I'm looking to free up some space in my freezer and am trying to can the various ingredients I use in my smoothies. I have been unable to find any recipes for canning strawberries without sugar or pectin. Thanks! Yes, you can mash strawberries and can them. On their own, though, they don't hold their colour very well without added sugar. That's likely why you don't see a lot of recipes for preserved strawberries without sugar. How far from the top should I fill the jars if freezing?? Also, if I were to use other jars such as old jam and pickle jars, will they refreeze?? If freezing, I would use freezer-suitable containers. Whatever you normally use for freezing liquids in smaller portions. Bernardin does some freezer containers as well. I meant to ask if I were to reuse old jam jars, like from store bought jams, will they reseal, not refreeze. No, factory processing is different from home canning processing and I wouldn't trust a factory jar to re-seal on my home preserves. 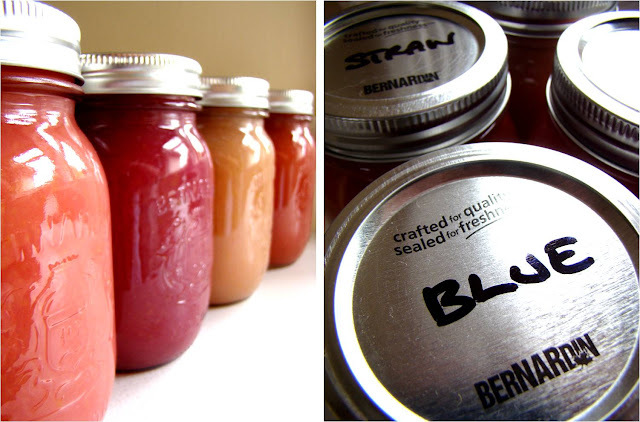 The gold standard in home canning is mason jars with a 2-piece lid. Good luck! I've been using the Bernardian home canning book. It says when making apple sauce you must use lemon juice to keep the colour and help keep the acidity levels up. They do not have a recipie for making apple sauce with an addition of other fruits. Is there a reason you don't use lemon juice? Since you've published a book I don't doubt the safety of your product I'm just curious why you chose not to add lemon juice. Thanks. Hi, thanks for the question. With raw apples I would add lemon juice to prevent browning, but I haven't found it necessary with cooked and canned applesauce. As for acidity, apples and the other fruits above (peaches, strawberries and blueberries) are perfectly safe to be canned on their own and with each other since all have a safe pH. We love using the immersion blender to pulverize everything. It makes it really simple! I am going to try the peach-applesauce. Sounds wonderful. One thing I can every year is applesauce and put in a handful of small cinnamon candies . I add the candies into the apples while cooking it and then run it through a Foley Food Mill. Put it in pints or quarts and process in pressure cooker, 5 pounds pressure for 15 minutes. This reminds me of the peach-apple pie I made up and that is delicious. Thanks for sharing your recipes. I always buy the unsweetened applesauce at the store. I just picked a lot of peaches and was looking for a fruit sauce recipe; I like to use applesauce on pancakes and think peach sauce will be better. I used more peaches than apples (what I had on hand) and am hoping it will turn out all right. It looks a little thin now.